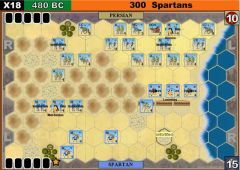 The “300 Spartans” scenario should be considered the “Hollywood” version of this semi-mythic historical event. 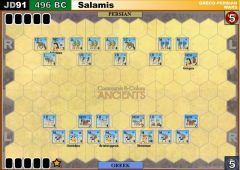 In the set-up and special rules I have tried to be true to the movie version of an epic battle, as opposed to trying to come up with a strictly historical scenario. 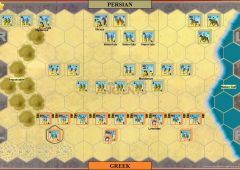 Scenario Note: The scenario probably requires the use of at least two C &C sets, however folks with access to miniatures can probably improvise something. 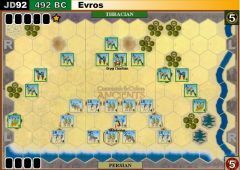 5 Command Cards (all chosen randomly)---reduced to four cards if Xerxes evades off-map—discard one card immediately upon such an evasion. 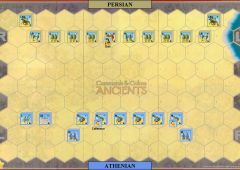 Spartan Player: 15 Banners or eliminate Xerxes---if Xerxes evades off the map he is not considered eliminated for victory purposes. 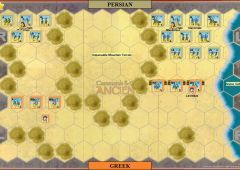 Persian cavalry and chariot units may not close-combat or move/retreat/evade to broken ground hexes. 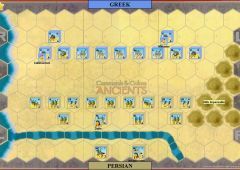 Leaders may move through broken ground hexes when ordered by themselves and do so as if these were clear hexes. 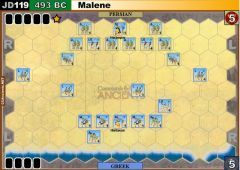 Attacks (not battle-back) through the front hexsides of such hex tiles while targeting a unit on the tile do so at one less dice than ‘normal”. 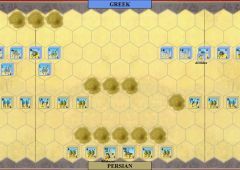 Persian cavalry and chariot units may not close-combat through such hexsides in either direction—(although they can move through such hexes, and battle-back through the front hexsides). 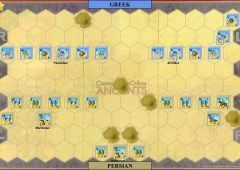 Spartan/Allied units occupying Rampart tiles & hit by missile fire (Flag or color hit) shot through the front hexides roll one normal six sided dice for each such hit—if the roll is “5-6” that hit is ignored. 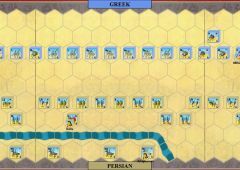 Rampart hex tiles DO NOT Block the line of sight, The above rules for the Rampart tiles are in lieu of those found in the rulebook. 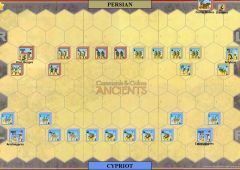 from his hand the instant the Greek camp tile is removed by the Persian Player—his hand will stay at four cards for the remainder of the game. 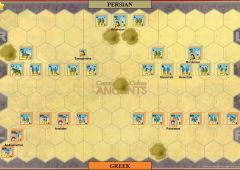 Asiatic Army: The Persian Army is assumed to be a typical Asiatic ‘horde’, greatly outnumbering, but inferior in both equipment and fighting spirit to the forces of the free Greek city-states---In Close Combat and Battle Back ALL Persian units make no hits on their enemies if Swords are rolled—always consider Swords to be a ‘miss’ when rolled by the Persian Player. 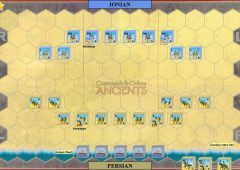 Immortals: All Medium Infantry units in the Persian host are considered to be Xerxes’ “immortals”, these units may move when ordered exactly like Auxillia in the normal rules, but are otherwise treated the same as Medium Infantry, with the exception of the Asiatic Army rules concerning ignoring sword rolls above which affect ALL Persian units regardless of type. 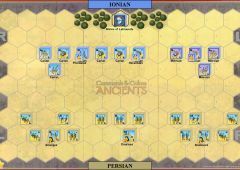 Asiatic Levies: All Auxilla in the Persian host are considered to be the standard regular Asiatic infantry levies of the Persian Army. These units have no missile capability. 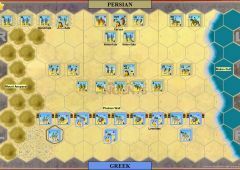 Persian Cavalry: All Persian Light and Medium Cavalry may (or must) retreat a maximum of 2 hexes per Flag rolled against them—they may not close combat or move/retreat/evade into or through broken ground hexes. 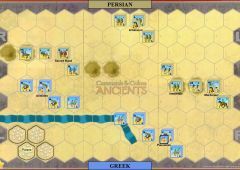 Persian Chariots: When attacking Persian Chariots roll only three dice rather than the normal four dice— they may not close-combat or move/retreat/evade into or through broken ground hexes. 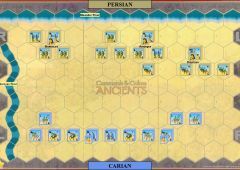 Units on the Persian side involved in close combat / battle back with the support of a Leader may only count one helmet hit amongst those rolled to inflict a hit on an opposing unit. 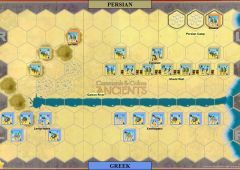 Xerxes must remain attached to the “immortal” Infantry unit he starts the game stacked with. He may not leave that unit until it is reduced to 2 blocks or less. 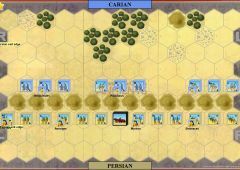 Off Map Persian units: Five Persian units start the game off-map…these may enter in a vacant hex on or between I4 to I12, only to replace a lost Persian unit of the same type on a one for one basis. 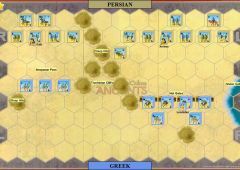 Starting with the second Persian Player-turn the Persian Player may choose to bring them onto the map. 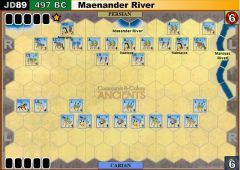 Before playing his card for a Player-turn he may chose to place the eligible to enter off-map units in any vacant map-edge hex from I4 through I12. 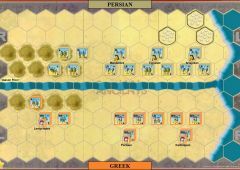 They may than be ordered by the card the Persian is about to play as appropriate. Once on the map they cannot leave it again save by elimination. 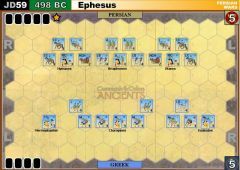 The eliminated units the off-map units are replacing still count for banners scored by the Spartan/Allied Player. 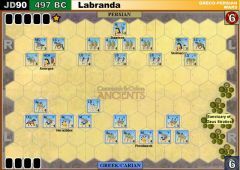 bodyguard of King Leonidas. 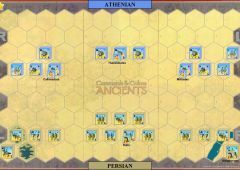 Spartan Hoplite units that still have three or four blocks, once all block losses are taken in a combat (hand to hand or missile), may ignore up to one retreat/flag result from the combat at the option of the Spartan/Allied Player.